If you’re looking for Vintage Mens 70s shirts, you could be looking for just about any type of 70’s shirts that the decade had to offer, because we are looking at a variety of different styles that hit this most colourful of decades. At the beginning of the decade mens 70s shirts were similar to what had gone before in the previous decade, but as the years wore on, a new aesthetic was growing – hippie chic. This most beautiful of bohemian looks created hippy shirts, camisole tops, off the shoulder peasant blouses, cheesecloth and beautiful lace and cotton tops that reflected a new and more relaxed vibe. The disco era towards the end of the decade brought in sparkle, sequins and brightly coloured trousers and tops that had everyone dressed up to the nines and dancing to Chic and Saturday Night Fever. If you’re looking for vintage mens 70s shirts then, it really does depend on where you lie on the 70s style spectrum. 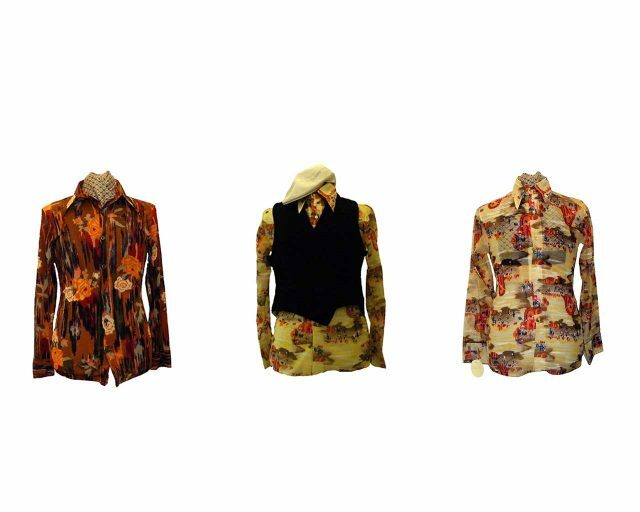 Are you a 70s brightly coloured dude who embraces the big collars and cuffs of the early to mid-70s, or are you a hippie girl who loves the pleasantly relaxing look of custom made blouses for the bohemian styles of the mid-70s, or do you love a bit of disco bling? Whatever you love best, visit Blue17 for the best of the bunch in mens 70’s shirts.